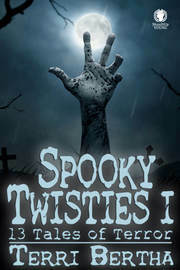 It's here -Spooky Twisties II ! Spooky Twisties II: What happens when your average suburban town becomes a nexus of the paranormal and occult and no one told you about it? 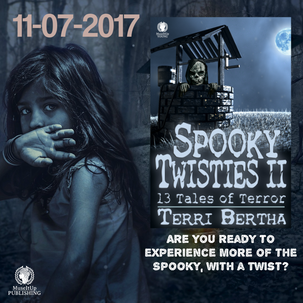 Spooky Twisties II is the second book in the Spooky Twisties Series offering 13 standalone yet interconnected ‘scary’ short stories continuing the supernatural adventures of Amy, Nick, Chris, Lindsay and their friends. Follow the horror and humor as the kids encounter and work through more unexplainable weird events in what was once an ideal normal community. From deciphering an old map and learning about an old town rumor, finding a briefcase of money, babysitting a small boy who has some strange habits, and being revisited by ‘old friend’, lead the tweens into some bizarre, creepy dilemmas. The kids also learn that magic sets and items bought from the town psychic have greater powers than what they originally imagined. Don’t be afraid, as I’ll hold your hand and together we’ll re-enter their Spooky world, with a Twist! Come and join me in my Spooky neighborhood, but watch out for some ghostly happenings and creepy characters. Yes, we’ll meet a couple of creepy people. We all know them, that certain someone with strange habits and basically weird. Will you go back to the cemetery with me to play our games and pranks, or is it getting too scary to trek amidst the tombstones? What about the old woman who lives at the end of the street? I hear she gives out nice big treats on Halloween. I’m game for stopping by at her house this year, are you? By the way, how old is she anyway? I enjoy hanging with this group of kids and seeing how they handle the dilemmas they face daily, as their average suburban town becomes a nexus of the paranormal and occult. I’ll hold your hand as we navigate through the Spooky, with some twists.